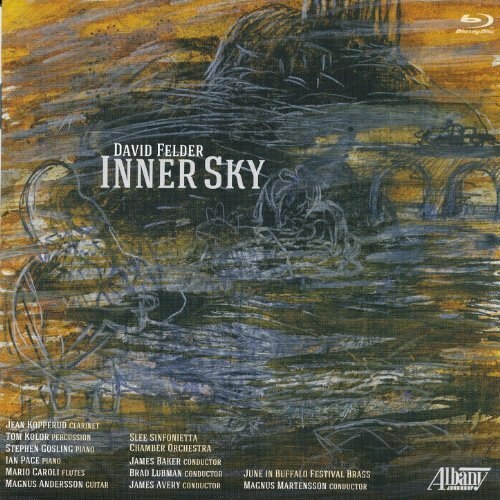 David Felder's music may be somewhat difficult to categorize for the average listener. Electronics are an important component, not simply as an enhancement to human players in an orchestra, but as an additional instrument: a concerto for electronics and orchestra. This idea is beautifully expressed in the opening piece, "Tweener," where electronics and the Slee Sinfonietta combine to give a feeling of the "music of the spheres." Vigorous oscillations across many octaves from the very high to a descent well below the baseline by the rarely heard, contra-bass clarinet, attempt to express the feeling of infinite space. "Rocket Summer" is this reviewer's favorite piece on the CD. Written in 1979 and revised in 1983, it represents the earliest of the Felder pieces on this recording. The title of the piece is taken from the first chapter of Ray Bradbury's Martian Chronicles, which depicts a rocket lift-off from an Ohio launch pad during a winter storm. Pianist Ian Pace sets the tone of the rocket with repeated notes and pulsating chords that build to a crescendo as the rocket prepares for lift-off. As almost a contrast, an Ohio blizzard swirls around as the rocket lifts off. Then, silence—escape velocity is reached. Looking outward at the vastness of space, the ferocity of the Ohio blizzard is but a distant memory. "Requiescat" rounds out the disc with a tribute to new music conductor/pianist James Avery. Beginning with the superb deep tones of Jean Kopperud on the contrabass clarinet, this piece surveys single notes and multiple chords with guitar accents from guitarist Magnus Andersson. The resulting swirling sounds are typically Felderian, as the focus of the piece seems to shift from one group of instruments to another until a single sound fades to black. If you can find someone with Blu Ray capability, don't miss Rare Air. Written in 2008, the piece is in four parts and is meant to be interspersed throughout a larger program. Jean Kopperud playing clarinet and garden hose to produce sounds reminiscent of frogs, geese, and ducks is not to be missed in part 1. Part 2: Rare Air: Boxmunsdottir and part 3: Rare Air: Boxmunsson show Felder at his best, playing in the low registers with clarinet and piano doing repeated notes and octaves in a swirling pattern and colliding with electronic sounds. Part 4: Rare Air: Aria da Capo completes the collection with a short return to the serenity of nightlife beside a pond with flying insects and other night-flying creatures.